press release: 9 Story Entertainment Announces Sale of CAMP LAKEBOTTOM Season Two to Disney XD U.S.
Toronto, Canada – June 22, 2014 – 9 Story Entertainment is pleased to announce that it has licensed an additional 26 x 22’ episodes of the animated comedy series Camp Lakebottom to Disney XD U.S. The second season of the series has also been picked up by Disney Channel and Disney XD channels in international territories including the UK, CEEMA, India, Japan and Latin America. The announcement comes shortly after the second season was greenlit by TELETOON Canada. Camp Lakebottom premiered on both TELETOON Canada and Disney XD in July 2013. 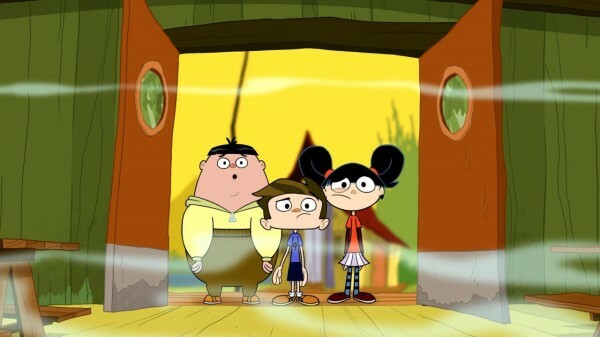 The series’ first season, produced by 9 Story Entertainment for TELETOON Canada, has also been sold to multiple international Disney Channels in the UK, Ireland, Benelux, Italy, CEE including Poland, Asia including Japan, Korea, Hong Kong, Taiwan and India, Middle East, Turkey, South and Sub-Saharan Africa, Latin America and Spain and Portugal (through Luk International). It has also been licensed to ABC TV (Australia), Super RTL (Germany), Canal + Family (France & Africa) and Noga (Israel). Camp Lakebottom is an animated comedy about 12-year-old prankster McGee, who was headed for an awesome summer at Camp Sunny Smiles when his bus took a wrong turn and landed him at old, run down and ridiculously spooky CAMP LAKEBOTTOM! McGee soon discovers though that Lakebottom is not just your average camp; it’s the BEST CAMP EVER! This entry was posted on Monday, June 23rd, 2014 at 9:05 am	and is filed under News. You can follow any responses to this entry through the RSS 2.0 feed.